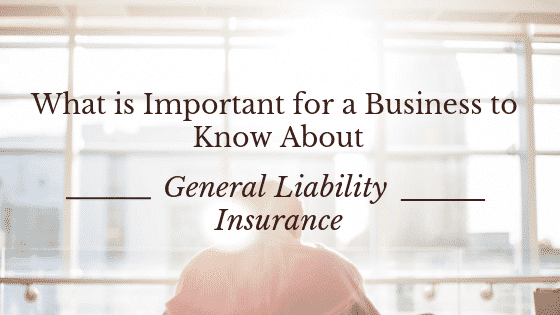 Business Liability Insurance is also known as General Liability Insurance (GLI). It is designed to help a business be protected from advertising injury claims as well as property damage claims, bodily injury claims and more. GLI will provide coverage for a business against lawsuits and customer injuries. It could be used to pay for legal costs, medical expenses if there is an incident resulting in a lawsuit. Businesses will invest a lot of time and effort in creating and growing their company. They will need a general liability policy to protect their investment from some type of incident that could result in devastating costs caused by a successful liability claim. Many of these can occur during common business situations. It includes employees or others who visit and represent client companies. GLI will be able to protect a company’s property as well as its business activities that take place at third-party locations. It is designed to work like many other insurance plans. The policy will list the highest amount an insurance company will pay in a liability claim. Smaller businesses may get $300,000 for costs resulting from an injury occurring at a worksite. It may also provide an additional $100,000 for legal fees. This means the most a company will get from the policy is $400,000. Anything over that amount will be the responsibility of the company to pay. *Advertising Errors – This will protect a business owner against claims of alleged advertisements that infringe on a copyright as well as false advertising and more. *Rental Property Damage – A business owner will be protected from damage caused by lightning, explosion, fire and more for any property they rent. *Property Damage Or Bodily Injury – This could protect a business owner against claims of damage to property or bodily harm caused by the business. *Medical Payments – If a person experiences an injury at a business, this will help with the costs associated with their medical treatment. *Reputational Harm – This will cover slander, malicious prosecution, libel as well as a violation to the right of privacy, wrongful eviction and more. The cost of a general liability policy will be determined by using a number of different factors. A major factor will be the type of business. A restaurant business has a higher exposure for risk than a consulting company. The amount of time a company has been in business is a factor. Experience often results in lower premiums. The location, size as well as the condition of a company’s premises will also influence GLI rates. A company’s history of insurance claims against them will also be a factor. There are also policy specific details that will impact the cost of a policy. These are such things as preferred coverage limits, amount of the policy’s deductible and more. When a company has an incident that could result in a claim being filed against them, they should immediately notify their insurance agent or the insurance company directly. The insurance company will want to know the details of what happened. It is important to be able to tell the insurance company the date and time of the incident. They will also want to know if there are any witnesses, their names and how to contact them. All other information that could be pertinent to the claim should be provided to the insurance company. When choosing which insurance company that would be a good fit, businesses should do some industry research. There are some insurance companies that focus on providing coverage for specific industries. Speaking with similar companies will help a business owner realize what type of coverage is necessary and what type of premiums are appropriate. It is unwise for a business at any level to not have a GLI policy in place. It will pay for liability costs and more when a company needs to meet these types of obligations. A GLI policy is designed to protect a company’s assets. It can protect a company if they are successfully sued. It will cover any award or settlement involving losses suffered by an injured party. GLI policies can protect against damage from natural disasters, criminal activity and more. It is an important way for a company to experience a bad incident and still continue operating. I doo not even know how I ended up here, but I thought his post wwas great. to a famous blogger if you are not already 🙂 Cheers!